When I am flame working glass, I work with “hard” and “soft” glass. Each of these require a different approach. Hard and soft glasses have many technical properties that make one more appropriate for a specific task. For example, hard glass is not as “shocky” as soft glass, so it is easier to create sculptural work without the piece breaking during the process. 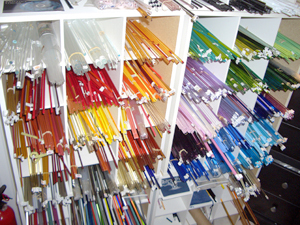 When I design using soft glass, I lay down a specific color by melting the glass, then add another color on top of that, embellish with a third color, and so on. The color palette is mostly determined by my choice and placement of glass. Of course, flame chemistry and metallic reactions occur occasionally, but for the most part, soft glass is a what-you-see-is-what-you-get process. However, the colors I like to work with in hard glass, or borosilicate glass, are more of a chemical reaction with the resulting colors. I may start out with a caramel color glass rod, and end up with a bead or sculpture piece that is imbued with sapphire blues, purples and greens reminiscent of a nebulous galaxy picture shot by the Hubble Telescope. I love the ethereal affect and incredible depth I can get from these particular borosilicate colors. I use a torch that can heat my glass up to 2750º F. In the first photo, look above my torch and you'll see the ventilation system in my studio. Safety is a very important for glass artists: I want to protect my lungs, my eyes and my skin. Also visible in the photo is one of my kilns used to anneal glass. When heating glass and creating a piece, stress is introduced into the glass which needs to be worked out through an annealing process. If glass pieces are not annealed, and the stress is still present in the glass, it could eventually have fractures or shatter. Different glass products and the size of pieces determine how long and at what temperature the piece should be kiln annealed So, the annealing process is critical in that it produces a more “durable” glass piece. Of course, this is still glass, so one must take care of their glass pieces just as they would with a fine, cut jewel. 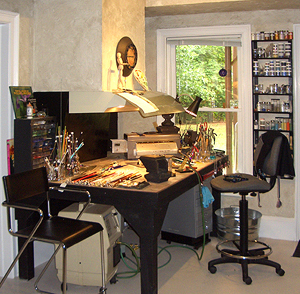 I have a separate area in my studio with my jewelry tools and supplies for incorporating the glass and jewelry components. Additionally, I have an area for hammering and cutting glass sheets . 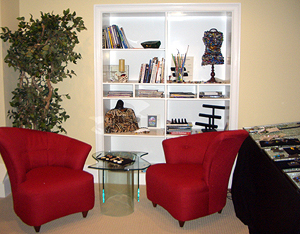 I found I needed a separate area outside of my studio to consult with clients, as we would both be too distracted in the studio with all the glass, works in progress and beads lying around. When meeting with a new client, we explore colors and examine color samples I have on hand. We discuss draping (if its jewelry they desire) size, and budget. We then fill out a custom order sheet which outlines all of our decisions. After that, I get busy in the studio and start working towards our vision. Sometimes serendipity comes in, and from the creation process, I find another option to present to a client which may or may not be the final direction we take. Pictures can be sent electronically to touch base on this journey, and if it’s a jewelry piece, final fittings take place. All in all, my process is about choosing a direction that fits a client’s desires, staying up with and incorporating new techniques, glass and tools into creating the piece, maintaining a safe and functional studio that produces a final piece that has structural integrity…as well as making the client wildly happy with the end result!